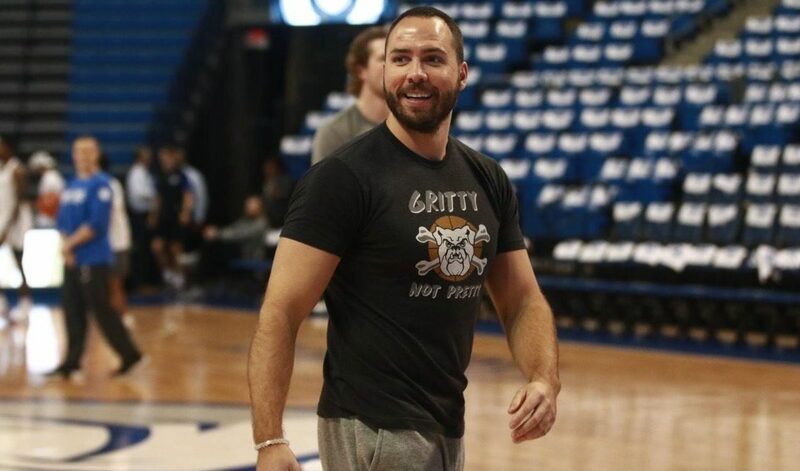 Butler men’s basketball strength and conditioning coach Matt Johnson joined the program in July. Johnson previously worked at George Washington. Photo by Jimmy Lafakis. Matt Johnson spent his 2018 Fourth of July holiday taking in the ocean breeze in Cape Cod, Massachusetts. His girlfriend, Katie, has a beach house on the Cape. They spent quality time relaxing by the Atlantic Ocean while Johnson prepared for his next mission. In a few days, he would move from Maryland to Indiana. Johnson was hired as the team’s strength and conditioning coach in June after spending five seasons at George Washington University. He arrived at Butler shortly after his vacation and met with players in the film room. Johnson recognized that doubt in his prior research. While on vacation, he found preseason rankings for Butler’s upcoming season. He decided to use those predictions as a motivational tool. That tool morphed into a hashtag, #HungryDawgs. The coach started using the hashtag on social media. Soon, players, coaches and fans included it in their posts. The Bulldogs bought into Johnson’s brand. To truly understand why Johnson is so fiercely passionate about his work, you must go back to his roots. He played college basketball at Division-III Marywood University in Scranton, Pennsylvania. Johnson said his initial love for strength and conditioning has only grown over time. When he steps foot inside the weight room, the players feel his presence. Johnson likes to implement a plethora of workouts. At George Washington, he and the Colonials’ strength and conditioning staff assigned boxing workouts to the team. He brought those unconventional ideas to Butler. He brought in a DJ, Marc “Mr. Kinetik” Williams, to blast the players’ favorite tunes during a workout. Most recently, Donovan and freshman forwards Bryce Golden and Markeese Hastings joined their coach for friendly games of Spikeball on the beach before their official Battle 4 Atlantis showdowns. The family committed early, and the labor’s fruits are ripe. The Bulldogs’ summer grit and tenacity has translated to games, perhaps none more so than a particular play during the November contest against the University of Mississippi. With just over five minutes to play, the Bulldogs trailed 68-66. Mississippi’s center Dominik Olejniczak received the ball in the paint. The 7-footer went airborne, hoping to squash Butler’s run. Six-foot-seven-inch sophomore forward Christian David served as Butler’s last line of defense. David slid over to contest the potential dunk and rejected any hope of a slam. Baldwin knocked down a mid-range jumper at the other end, and the Bulldogs tied the game. Butler went on to win 83-76. In dogfights like that, plays like David’s block make a difference. Those grueling summer days spent in Hinkle Fieldhouse and on the Sellick Bowl have manifested into on-court successes. Most of the Bulldogs learned about the blueprints, hammers and screwdrivers just five months ago, but one Butler player was previously schooled in Johnson’s art of construction. Redshirt senior guard Paul Jorgensen spent two years with the coach at George Washington before transferring to Butler. Johnson said he has always been vocal in highlighting student-athletes’ work. “The game is won before it’s played,” Johnson said. The routine is a grind. Before Johnson, the program never had a strength coach of its own. Now that the 5-2 Bulldogs are competing in the thick of nonconference play, Johnson said he recognized his role during games.